Want to quickly see how the open-source software MyLittleForum works? You'll find a free and updated demo installation of MyLittleForum here. We are currently updating the MyLittleForum demo. Please check back shortly. There will be a new version up soon. 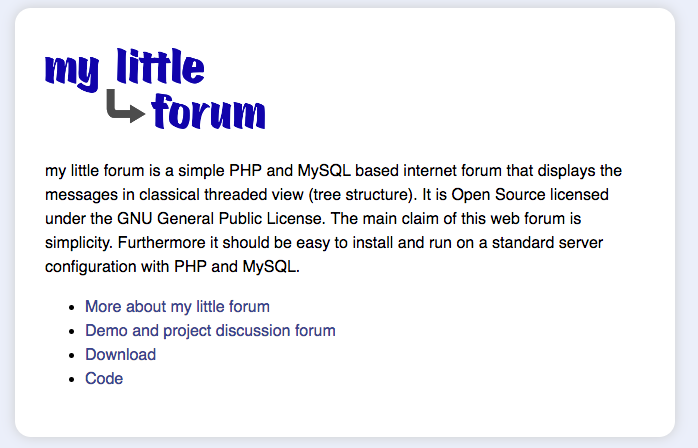 my little forum is a simple PHP and MySQL based web-forum that displays the messages in classical threaded view. It’s Open-source licensed under the GNU General Public License. The main claim of this forum script is simplicity. Furthermore the script should be easy to install and run on a standard server configuration with PHP and MySQL.